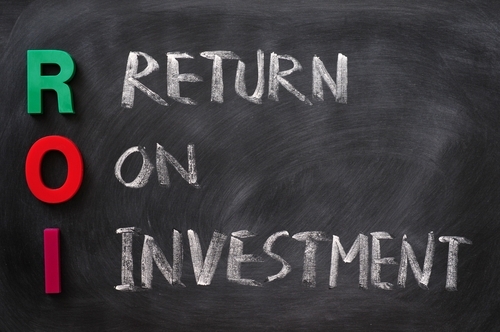 What Does “Quantifying ROI” Really Mean in Ad Spend? All marketers can relate to this cartoon, and while it makes us laugh, it’s a nervous laugh. The reality is that advertisers’ willingness to invest in an ad channel only lasts as long as until someone asks and expects a solid answer for “what are we getting in return?” There are numerous ways to waste advertisers’ money between the fragmentation of digital channels, paying for ads that get impressions but no action, and reporting on overvalued metrics that don’t increase the bottom line. The long-term commitment to ad spend lies in our ability as marketers to plan smart media buys and that drive the actions that our clients want. For most advertisers, to view a report that touts only impressions and clicks means very little. What other did actions did the user take? How long were they on the site, and on which pages? What did they do post click; did they purchase something online, or did they call to inquire more? If they called to inquire, how did the conversation go? Did the sales rep convert the call to a sale? If converted to a sale, what was the value of the sale and how can that be measured against the ad investment? These questions are critical for agencies to be ready and able to answer for their advertising clients. 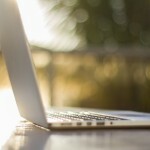 Today we have increased means of planning, performance-tracking, and quantifying ROI. 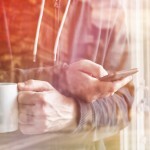 Connecting campaigns to Google Analytics gives us a more granular look at post-click activity. Ad and site coding allows us to tracking form-fills and phone calls. Special URL tracking strings allow us to track volume and record incoming calls. And call listening provides us the ability hear what happens on phone calls; to know how many are current customers vs. new, converting customers. This data culmination provides the tools we need to quantify ROI. The ROI can then be used to remove poor performing campaigns, and allocate dollars to the channels that prove the best return. A constant cycle, that makes ad campaigns leaner as they go. 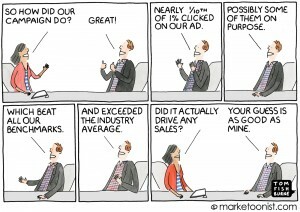 While there are a lot of steps necessary to close the loop from ad investment to ROI, the process cultivates a long term agency/client partnership through more substantive reporting on bottom line metrics, and it sheds us from any nervous laugh this cartoon might expose. Interested in learning more? Don’t hesitate to contact us today! Insights brought to you by our very own Rose H.